fix that in VDub or other editing software. is -40ms out of sync. Anyone have any comments to this? I don't see how this tool can determine how much the audio/video was unsynch but be carefull that is you set "40 ms" in vdub, this delayis just a muxing delay. 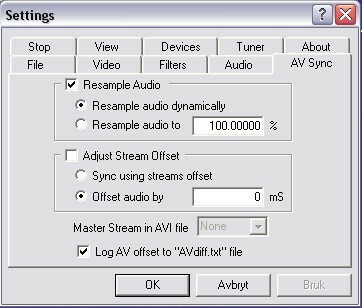 That means that once you will demux the video and audio stream, then you will have again the synch problem. 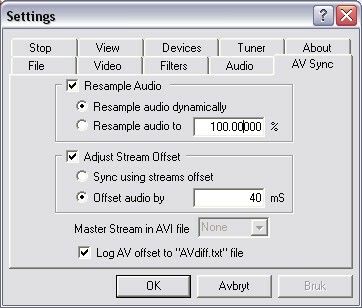 way software avi players corrects the desync when playing the file. I guess the AVI Offset Calculator reads the offset that way to. so after converting to mpeg,Ill have the desync. says 0 ms,should,at least theoretically,solve this problem. So adjusting stream offset in VVCR until the offset in avi file header says 0 ms,should,at least theoretically,solve this problem. Right. I did confuse VVCR with Vdub. I've got something like 120-160ms of offset, I've not used the calculator but VDub always inserts 3-4 frames at the beginning of my captures. Do you use the default timing settings in latest VDub? I like to hear your opinions. Yes, except that "Correct video timing.." is disabled, it might be enabled by default, I'm not sure. I actually think that if it's enabled, you get zero inserted frames at the beginning but I only got problems during capture with it. I think that inserted frames means in VDub that a new frame is inserted to compensate the timing error which occurs even if you have resampling enabled. This inserted frame is created like you suspected. A dropped frame means that the frame is lost and it is compensated by copying the last good frame. So the difference is that inserted frame means you do not lose anything from the original stream but a copied frame is added, dropped frame means you lost those frames. You probably won't notice a 40ms delay anyway, I think it's closer to 100ms before it gets noticable. Sounds good too me also. Yes, correct video timing is enabled by default. If I disable it I got a inserted frame every 5 second. audio and video is resampled. Reason :"Beacuse two is better than one". But I guess different hardware need different settings. improving the capture part of VDub. It's obsolete now that the VDub 1.6-branch does the same thing. The good thing about VDub 1.6.x is that it'll work with WDM drivers as well whereas the 1.5-based programs need VfW. It's obsolete now that the VDub 1.6-branch does the same thing. The good thing about VDub 1.6.x is that it'll work with WDM drivers as well whereas the 1.5-based programs need VfW. VirtualDub-sync is based on some VDub 1.5-build. The same resampling code is found in VDubMod as well, which is based on VDub 1.5.10 I think.